Welcome to our live blog from the College Station City Council’s workshop and regular meetings on Monday, May 14. It’s not the official minutes. Northgate Parking Meter Agreement: The $109,450 contract with IPS Group is for an upgraded on-street parking meter system in Northgate. The use of parking meters is designed to encourage turnover for businesses and to provide short-term parking options. The council heard a presentation by the Research Valley Partnership on project compliance in 2017. The council heard a presentation from College Station Fire Marshal Eric Dotson about the city’s controlled burn policies. The regular meeting has started. Councilman Barry Moore is absent tonight. 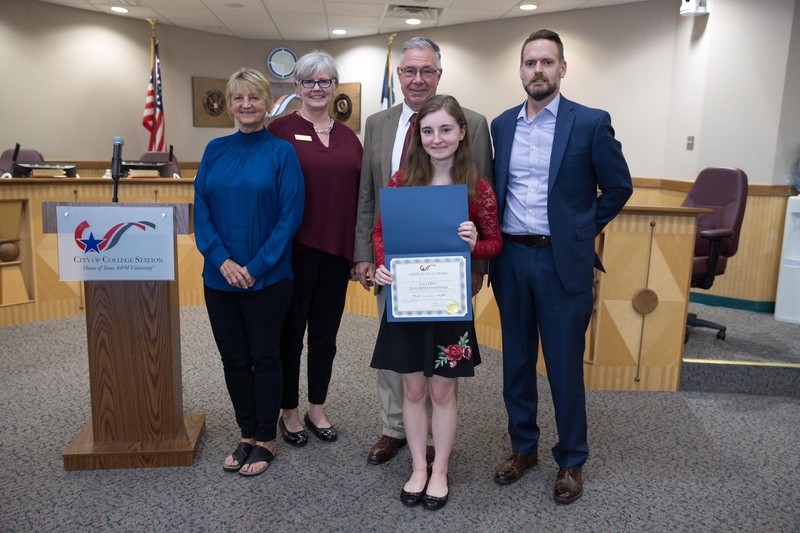 Chief Executive Officer Chris Dyer presented the Arts Council of Brazos Valley’s annual College Arts Scholarships, which are awarded each year to deserving young artists in the Brazos Valley. This year’s recipients are Anna Miller ($5,000) and Charlotte Brumbelow ($3,000) both of A&M Consolidated. Miller (below) plans to study music education at the University of Oklahoma, and Brumbelow will pursue a theatre degree from the University of Texas. Also pictured are ACBV board members Pam Smits and Coleen Bradfield, ACBV executive director Chris Dyer, and Mayor Mooney. Brumbelow was unable to attend. 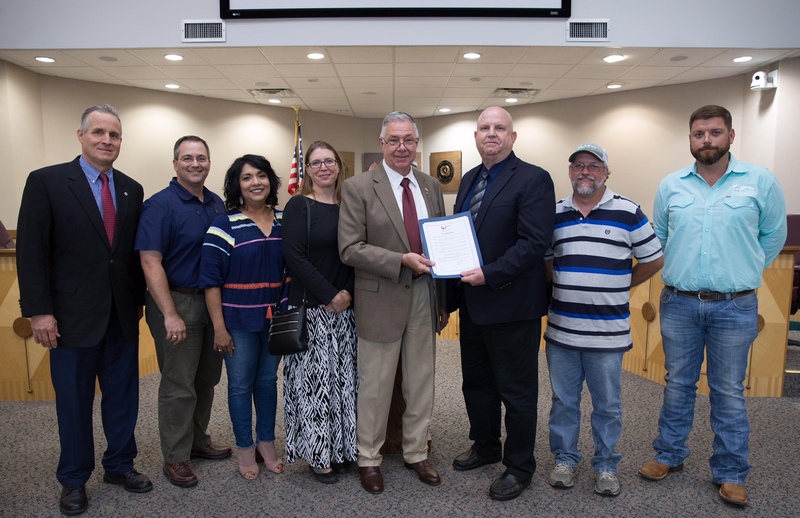 Mayor Mooney proclaimed May 20-26 as National Public Works Week to recognize public works for providing, maintaining, and improving the structures and services that assure a higher quality of life for the nation’s communities. 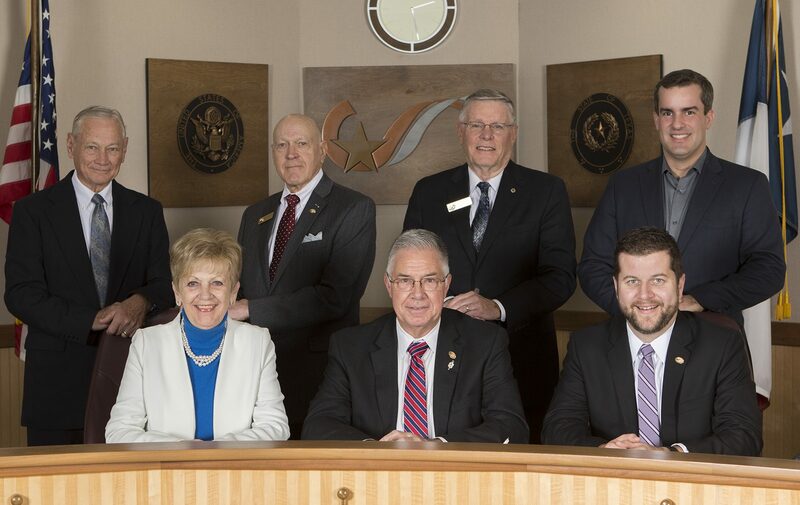 Pictured below are (L-R) Mark Mcauliffe, Troy Rother, Raquel Gonzales, Susan Monnat, Mayor Karl Mooney, Donald Harmon, Martin Mcgehee, and Jason Best. 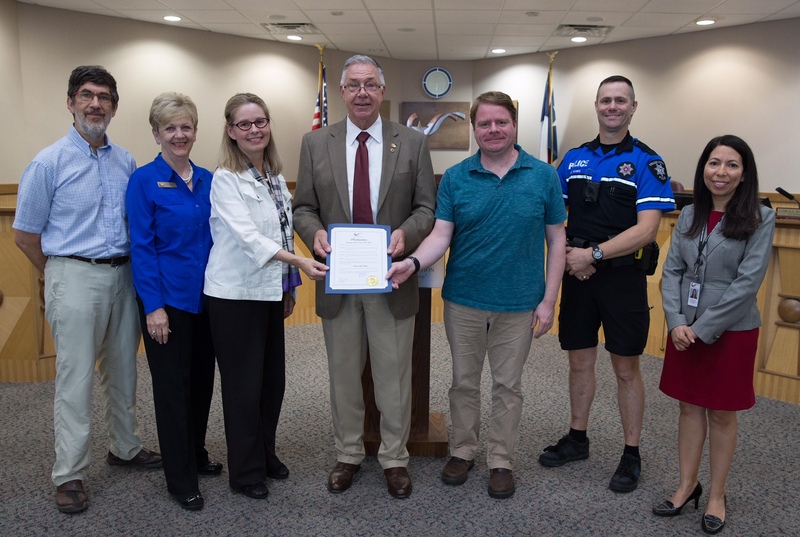 The mayor proclaimed May as National Bike Month to showcase the many benefits of bicycling and encourage more people to try it. Click here for more about biking and here for a map of local biking facilities. Receiving the proclamation (below, l-r) were Bicycle, Pedestrian & Greenways Board Member Jonathan Coopersmith, Councilwoman Linda Harvell, committee members Tina Evans and Neal Johnson, CSPD Bike Patrol Officer George Humes, and Bicycle, Pedestrian & Greenways Senior Project Manager Venessa Garza. Lisa Halperin criticized what she sees as the biased nature of the city’s recent survey about possible changes to its Unified Development Ordinance. Hugh Lindsay spoke against Texas A&M’s bike share program and how the yellow bikes are left all over town. A service and extended warranty contract for $109,450 with IPS Group to upgrade Northgate on-street single-space parking meters and for monthly operating and credit card transaction fees not to exceed $15,000 per year. A $128,736 contract with Jamail and Smith Construction for improvements to Gabbard Park. A $199,410 contract with Hawkins Architecture for renovating and rebuilding park structures in Bee Creek Park and Beachy Central Park. A $124,722 purchase order from Fouts Brothers for one light rescue response vehicle. An inter-local agreement with the City of Grapevine for cooperative purchasing activities. Renewal of an annual contract not-to-exceed $100,000 with Larry Young Paving for the repaving of utility cuts as needed. The Brazos Valley Wide Area Communications System’s FY19 operating budget, the city’s payment not-to-exceed $170,103.03, BVWACS FY19 capital equipment replacement reserve fund budget, and the city’s payment not-to-exceed $58,795.30. The council voted 4-2 to approve a request to change the name of The Bob and Wanda Meyer Community Center to The Bob and Wanda Meyer Senior and Community Center. Councilmen James Benham and Jerome Rektorik voted against the motion. In March, the council approved The Bob and Wanda Meyer Community Center as the building’s name. In April, the Parks and Recreation Advisory Board voted 7-1 to recommend renaming the building The Bob and Wanda Meyer Senior and Community Center. Consequently, the Senior Advisory Committee and Parks and Recreation Board asked the council to reconsider its earlier decision. After a public hearing, the council unanimously approved the updated Bicycle, Pedestrian, and Greenways Master Plan. Since the original plan was adopted in 201, the city has grown and changes warranted a re-evaluation of the community’s needs. As a component of the city’s Comprehensive Plan, the updated plan provides goals and strategies and focuses around the need to improve connectivity and accessibility, enhance safety, increase bicycling and walking, and encourage environmental stewardship. The council unanimously selected Johnny Burns to finish an unexpired term as the city’s representative on the Research Valley Partnership board of directors. The term ends in June. After the council discussed and reviewed future agenda items, Mayor Mooney adjourned the meeting. The council meets again Thursday, May 24. This entry was posted on May 14, 2018 by City of College Station. It was filed under City Council, Public Communications and was tagged with arts council building, arts council scholarships, bicycle, Bob Meyer, controlled burns, Council Meetings, Grapevine, National Bike Month, National Public Works Week, parking meters, pedestrian and greenways master plan, Research Valley Partnership.